This is my sahti recipe adapted for typical homebrewing equipment. I have refined it based on my own taste, various brewing experiments and conversations with renowned sahti masters. Thus this is not a classic family recipe, but nevertheless it produces a good example of today’s Finnish homebrewed sahti. The recipe comes with plenty practical farmhouse brewing tips which largely apply to brewing of koduõlu, gotlandsdricke, maltøl and kaimiškas as well. In this text I will concentrate on practical brewing issues. For a general overview of brewing traditions read Sahti and Related Ancient Farmhouse Ales. If you are interested in brewing historical beers, see History of Farmhouse Ales to learn how sahti relates to medieval ales or viking age ales. Sahti is a very process driven beer, and the old techniques are the key to success. Proper ingredients alone won’t yield authentic results. Modern brewing equipment can be easily fitted for the old brewing processes. Wooden vats and kuurna would certainly look cool, but stainless steel won’t rule out ancient brewing techniques. Some modern brewing practices need to be ignored. Modernizing the process based on current brewing knowledge often leads to modern tasting and less authentic sahti. Some techniques may sound like a recipe for disaster, but trust me, I have tested these things. Homebrewed sahtis are extremely varied. Although I consider my sahti recipe typical, very different examples exist also. To my mind proper sahti can be brewed without sourcing exactly the same kind of malts, yeast and juniper ingredients the Finns are using. Farmers have brewed with what they got and so can you. Most sahti brewers use Finnish Sahti Malt as their base malt. Viking Malt produces this proprietary barley malt blend principally from Pilsner malt and smaller amounts of specialty malts. However, any combination of Pilsner, Vienna or Munich malts will make a good sahti. My own favorite blend for sahti is ¾ of Pilsner and ¼ of Munich. Most sahti recipes include 5–10 % Finnish dark rye malt called kaljamallas. This unique lightly roasted malt (color unit is around 180 EBC) adds color and lends a soft taste of dark rye bread. Although it is not a caramel malt, the best widely available substitute is perhaps caramel rye malt. Sahti gains its juniper flavor from branches which give woodier and more needle-like taste than berries. Most sahti folks prefer delicate juniper character, and none is always better than too much. In fact, if sourcing branches is difficult, I recommend brewing without juniper. Not even all the Finns are using juniper today and the National Sahti Competition has been won with a juniper-less sahti. The taste of branches may vary significantly depending on number of things like species, location and tree gender. In traditional sahti regions the species Juniperus Communis of subspecies Communis. Other species may look and taste very different, but I see no problem in using them as long as the branches are edible and taste good. Bear in mind that some juniper species may be toxic. Berries are an acceptable substitute to branches, although the flavor difference is noticeable. 6 g of berries added to the mash is a restrained starting point for a 20 L batch. Traditionally juniper branches are laid as a filter on the bottom of the lauter tun, but with a modern brewing setup this can be difficult to do. Adding juniper branches to the mash is an easy shortcut for flavor. In the mash surprisingly small amount is needed: 10 g of branches for 20 liters of sahti gives noticeable yet delicate taste. I used to add a small amount of hops to my sahti, but then I noticed that sahti folks like my sahti better without any taste of hops. Thus I no longer use hops in sahti. For authentic sahti you need baker’s yeast, or a traditionally maintained house yeast culture. Brewer’s yeast would produce good ale, but that would not be sahti. Suomen Hiiva’s fresh compressed baker’s yeast is by far the most popular sahti yeast, but it is difficult to obtain outside of Finland. On the other hand, Finnish and Estonian farmhouse brewers have tried many European baker’s yeast brands and they generally seem to be suitable for fermenting farmhouse ales. I advise to try your local brand of baker’s yeast. Baker’s yeast may contain small amount of lactic bacteria, which is usually the reason for souring of sahti. Nevertheless with the methods outlined below sahti should withstand souring for several weeks as the traditional farmhouse brewing techniques have evolved to combat bacteria. Kaljamallas, a dark rye malt for brewing sahti and low alcohol small beer kalja. Traditional brewers usually mash for 5–9 hours by raising the temperature slowly from hand-warm to hot. This method reflects the past of wooden mash tuns, lack of thermometers, and less ideal homemade malts. I have simplified the procedure to three steps (60–70–80°C) and to about two and half hours. This method seems to take most out of today’s commercial malts, but if you want to mash in the most traditional way include steps at 40°C and 50°C and mash for at least five hours. This sahti recipe makes a raw ale, that is, neither wort nor mash is boiled. I know from a personal experience that brewers who have read their brewing books would like to add a short boil for sanitation, but that really isn’t necessary. I have fermented raw ales several times with brewer’s yeast and not a single time the ale has gone sour. Farmhouse ales were once fermented at hand-warm temperatures, but then the house strains were adapted to such temperatures. For baker’s yeast I recommend the range 18–25°C which is fairly typical among Finnish brewers. The lower end gives maltier sahti while the higher end emphasize fruity and spicy flavors. Sahti should be moved promptly to cold when fermentation begins to calm down. Most brewers do this before fermentation is completely finished, and slow secondary fermentation may continue in the cold up till serving. This method protects effectively from souring and staling, but it takes some practice to master. With rustic baker’s yeast sahti may also taste better when still sweet and slightly unfermented. Thus the finishing gravities of homebrewed sahtis are often fairly high, as in the sahti recipe below. You may also ferment to finish, but still transfer the ale to cold without a delay. As soon as yeast drops out, lactic bacteria may have its chance. Sahti is not carbonated intentionally, but it may have some fizz from the secondary fermentation. Because sahti can still ferment in the cold storage, it is usually stored in containers which allow checking and releasing pressure. Farmhouse brewers typically use plastic canisters and PET bottles. Swing-top glass bottles can be used, if pressure build-up can be prevented with certainty. Sahti can be kegged and pushed out with carbon dioxide, but for authentic low carbonation avoid storing sahti under pressure. To avoid souring sahti should kept cold at all times until serving. Sahti stores best at 32–54°F (0–12°C) – the colder the better. Above 59°F (15°C) the ale can go sour even in a half day. Even if sahti does not sour, it loses its freshness sooner than modern ales. Drink fresh. Plan your brew with a peak moment in mind and consume within few weeks. Mash grains at 60°C for 45 minutes using 2.3 liters of water per kilogram of grain. Mix juniper branches into the mash. Raise temperature to 70°C for 45 minutes, and then to 80–85°C for 15 minutes. Begin lautering, and recirculate until wort runs clear. Sparge with 80–90°C water until 20 litres of wort is collected. If using immersion chiller, insert it in the beginning of lautering into hot wort to sanitize the chiller. Chill the wort to fermentation temperature. Dissolve fresh compressed yeast into a small amount of cold water, or rehydrate dry yeast in 40°C water. Pour the whole wort into fermenter – since wort is not boiled there is no trub. Add yeast and ferment at 18–25°C until fermentation begins to calm down. Depending on the yeast and temperature, this takes 1–3 days. When sahti still tastes sweetish, but not cloying, move fermenter to cold. If unsure, check if the gravity is in the range 1.034–1.038. Cold condition sahti for 7–10 days and then rack into containers. Store cool at all times and release the pressure occasionally if necessary. The ale is ready in 10–14 days from the brewing – as soon as bulk of the yeast has settled. I brew both sahti and modern beers with the same kettle combining mash tun and lauter tun. A slotted copper manifold takes role of the filter instead of juniper branches. Photo by Mari Varonen. I would like to add an off-hand comment regarding mash temps. The 2 lowest steps @ 40 & 50C are very important if the desired final beer (i.e sahti) is to contain a noticeable phenolic taste-aroma. Mashing for an extended time (1hr or more) at or below 50C helps release the hydroxycinnamic acids (ferulic and p-coumaric) that, after yeast activity, contribute to the the spicy-clove flavour of a beer. If you skip the low temp rests then the resulting sahti will most likely have far less of the clove flavour that is said to be a characteristic of the style. For homebrewers looking to mimic that typical sahti flavour and unable to buy the Finish baking yeast, then any good hefeweizen yeast should be able to contribute the similar (but not identical) banana-spicy flavour profile. That is true, the mash temperatures around 40–50 C will enhance phenolic flavors. The lower mash temperatures will also break down highly viscous beta-glucans, which is important if the grist contains large amounts of rye malt or unmalted grains. Phenolic flavors are typical for sahti, but the also the brewer-to-brewer variation is enormous and some sahtis can have little phenols. Finnish fresh compressed baker’s yeast is somewhat similar to weizen yeast, but just far more rustic. Definitely agree on the huge variation of flavours possible for sahti. That’s why different brewers with differing mash schemes can have a huge impact; with some clove bombs, others spicy-banana and others fruity-banana only. And that’s before adjusting for water, grist and juniper differences between brewers as well. The yeast question is an interesting one, as baking yeasts by default are capable of excreting large(r) amounts of acetic and succinic acid than respective brewing yeasts. These acids are vital to dough rheology properties. One wonders if some of the more dry-tart versions of sahti aren’t spoiled by LAB at all, but simply the result of that particular Finish baking strain. A question I pose to an experienced sahti brewer-connoisseur. Overall, do the Fins typically allow home brewed sahti to bottle referment/condition to any degree, even in those PET bottles? or is it always served near flat? Finlandia and Lammin’s commercial versions are bottled with no condition, but I know fresh home made sahti from the keg can still be a bit lively if drunk in time. I often wonder about those home brewers that bottle it. Since nobody has commented this question of carbonation I’m answering it myself. Today most sahtis are flat, but some brewers like a little fizz (similar to real ale) caused by secondary fermentation in the cold. This fizz is more apparent if sahti is served where it is brewed. When these brewers rack sahti to new canisters or bottles for transportation, this fizz is lost and sahti becomes flat. Historically sahti wasn’t always flat, because it was scooped into a wooden cask while still slightly unfermented. Old texts describe how sahti was ‘kicking’ in the cask, although there were ways to prevent higher pressure. The first pints from the cask were at least sometimes frothy, and the last pints might have been flat, much like with real ale. About cold conditioning after fermentation: is it beneficial to drop the fermentor temperature as low as possible? We have a temperature controlled chest freezer, so I’m wondering if I should drop it near 0C to help with conditioning. Would this be better than, say, 7 degrees? People who produce a lot of sahti, either commercially or at homes, seem to prefer 0-5 C. So, I think that it is ideal range for both conditioning and storage. Some renowned masters drop to 0 C.
I’m curious as to anyone’s thoughts on the use of Eastern Red Cedar in lieu of juniper branches / berries as an alternative for us North American folks. They’re supposed to be in the same species as juniper. I’ve had varying levels of “success” with my brews using these branches. I’ve found they impart a flavor which could be best described as extreme woodiness or even dirt. The sahtis I’ve drank young (still fermenting) are actually quite tasty but they don’t tend to do well after even brief bottling. Perhaps it depends on when they are used in the brewing / fermentation process or possibly other factors? I’m curious too about the flavors American junipers branches. 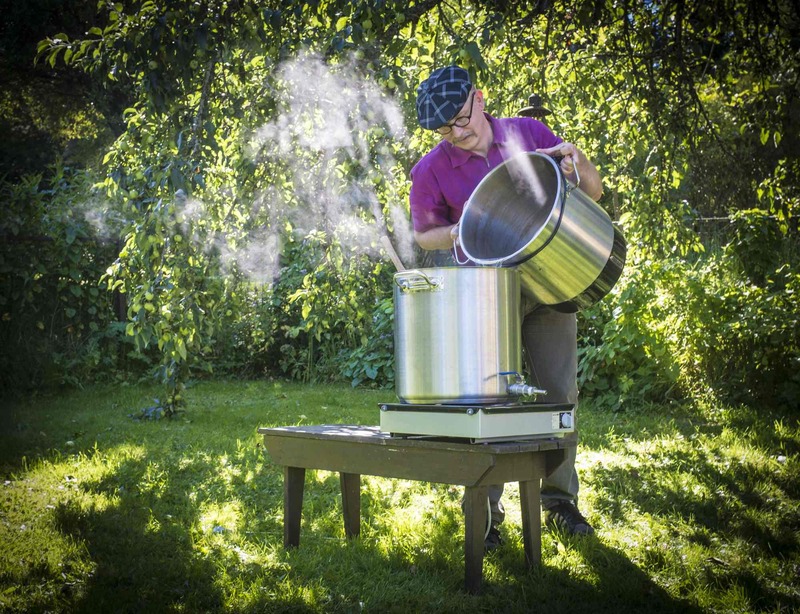 Finnish sahti brewers Pekka Kääriäinen and Markku Pulliainen said that the aromas and flavors of American junipers can be very different from the Nordic trees, even if the species is Juniperus Communis. Kääriäinen has been brewing collaboration sahti in three different locations in the United States, and he said that every time the flavor has been woodier and more piney than the Finnish juniper. The “shelf life” of sahti depends especially on storage temperature and above 10 C sahti can go off even in few days. I’m glad to hear I’m not the only one. I’m planning on minimizing the amount I use for future brews or just using real juniper berries. I have enjoyed the flavor of beers I’ve made with spruce. Would using spruce branches and needles with some juniper berries still make it an authentic sahti? Nordic farmhouse brewers usually don’t use spruce branches, but I can imagine that if a sahti brewer would land on a place where juniper doesn’t grow, she or he might as well use spruce or birch branches. The flavor would be different from Finnish sahti, but on the other hand, sahti tradition is founded on using local ingredients. Enormous diversity of brewing techniques is typical for sahti as well. So, in this extended sense spruce would be “authentic”, especially if the flavor is kept subtle. Anyway, sahti is more about malt and yeast, and seasonings are used in a very restrained manner. If you like the flavour of spruce, go for it! Agreed on the use of local ingredients. I think using juniper / Eastern red cedar as a mash filter only should keep the flavor subtle enough. And I can always use spruce and just call it a spruce beer. Thanks for your thoughts! Also, I’ve read that people have had success with non-Finnish bread yeast. Are you aware of any taste comparisons that have been done between sahtis with Finnish baker’s yeast and those with other types of baker’s yeast? Sorry, i do not undestand – should I put the fermenter under water look (no access air)? The traditional brewers cover the fermentation vessel with a newspaper, cloth or a loose lid during the most vigorous fermentation, and then move the ale to closed containers when fermentation calms down. I close the fermenter loosely without an airlock for the vigorous fermentation, and then attach the airlock when fermentation ceases. In this way I don’t have transfer the ale to the storage vessels so soon, and I get less sediment into bottles or canisters. Greetings, I am very happy to discover your excellent and informative website. I am third generation American Finn home-brewer learning to brew Sahti with mixed results. One thing I have discovered is that once fermentation has visibly subsided it’s important that I rack the Sahti off the yeast to avoid an overly tart result. About 5 days rather than the 3-5 weeks I am accustomed to for other styles. But this is likely in part due to using wheat ale yeast strains and modern equipment. I have not yet tried using bakers yeast, primarily because I do not have a local source for fresh baking yeast. I am wondering if dry baking yeast would be an acceptable substitute? Kippis! Yes, with sahti it is best to proceed promptly with the fermentation. It is best to cool the ale without delay after warm fermentation and then also rack sahti off the yeast to final storage containers soon. I normally rack sahti to bottles and canisters as soon as most of the yeast has settled, which is usually is after 5-7 days. Sahti shouldn’t need long maturation times and you can start serving it as soon as most of the yeast has settled. Dry baker’s yeast works well for sahti and even here in Finland some traditional brewers use it. I have tested several European dry yeast brands and they all seem to produce good sahti, although none of have produced hefty banana aroma typical for the fresh Finnish baker’s yeast. I have just completed a batch of sahti using pilsner and munich malt with a small percentage of rye and oat. Based on your website input I scaled back the juniper, using only several branches in the mash but also 10-12 crushed berries in a twenty-minute boil. The American juniper has imparted a nice, moderate gin-like flavor. Weinhenstephaner yeast has provided a balanced banana/clove flavor. I don’t know if this is anything like true Finnish sahti but based on research I feel like I am on the right track, My next batch will be fermented with bread yeast. When I was in Finland eight years ago I unfortunately did not know about sahti. My loss, perhaps I will have to plan another trip so that I can sample the true Finnish sahti! There is a local brewery in my area that brews what seems like a valid sahti. Kippis! I can imagine that judging the taste of sahti is difficult if you haven’t tasted sahti before. I have the same problem with some other traditional Nordic ales. Anyway, if your process is right and your sahti tastes quite different from a modern beer, you are certainly on a right track. Thick viscous mouthfeel from proteins and residual sugars is certainly a hallmark of sahti. Quick question. I have a bunch of Vienna malt, would it work to use just this with a little chocolate rye malt? I have brewed many good sahtis with just Vienna malt and small amount of dark rye malt. Even 100 % Vienna malt would make excellent sahti, but many brewers prefer to add small amount of darker malts for reddish brown color. Chocolate rye malt is much roastier than Finnish dark rye malt (known as Tuoppi Kaljamallas) but it will work, if used for 1-2 % of the grain bill. Higher amount of chocolate rye will add a sharper edge that takes away from smoothness and drinkability typical for sahti. Thanks for this article. I know Sahti is usually not boiled but have you experimented if the boiling introduces any flavor changes? Bringing the temperature up to rolling boil for just a couple a few minutes should kill all the nasties and do wonders for long term storage of sahti, hell it would even do wonders for the health of the drinker and how often he needs to run into the toilet to empty his bowels the next morning. 🙂 But is it true sahti anymore as far taste is concerned? Also can you make a Sahti like beer with BIAB (brew in a bag) method? I have been thinking about this, instead of Kuurna I could just add the juniper branches on the strainer that I lift my bag on after mashing to drain back into the pot. When I started brewing sahti in 2004 I used to boil the wort for ten minutes. Then I noticed that skipping the boil gives flavour closer to sahtis brewed with old family traditions, and anyway boiling is not needed for sanitation. Boiling the wort removes proteins and that will change flavour and mouthfeel. Raw ale from unboiled wort tastes more nourishing, has fuller body and smoother mouthfeel. With few minutes of boiling the change is not probably dramatic, but every minute of boil shifts the flavour closer to modern beer. Raw ale probably goes stale sooner, though. Sahti can be brewed with BIAB method but in my opinion it is not the most optimal method for sahti. BIAB works best with thin mashes, but in sahti the mash needs to be thick because the wort is not concentrated by boiling. Then, BIAB lacks the wort recirculation step and that gives fairly turbid wort and this turbidity stays in the wort if there’s no boil. If you were to brew sahti using just a single infusion mash (plus mash out), what temperature would you choose? Sorry for the heretic question. Actually this is not a heretic question. Some very traditional farmhouse brewers in the Nordic countries mash with a single infusion. These brewers tend to use high mash temperatures, such as 70-75°C. If there’s no mash-out or wort boil, high temperatures are certainly beneficial. But if you can do a higher mash-out rest, you could mash-in with 66-68°C. Personally I always start the mash with a temperature below 70°C, for both modern and traditional beers, because I find that the beer tastes better that way (I guess this is related to amount of dextrin). Are berries always left on the branches? I thought I read somewhere that they were sometimes taken off because of their bitterness? Some traditional brewers want to avoid green unripe berries but think that ripe blue berries in the branches are ok. Then, some brewers myself included do not mind including also green berries. The green berries increase the flavour and perhaps also bitterness. If the branches have lots of them, I would reduce the amount of branches. Thank you very much, I thought I had seen the advice to remove them when they documented a Voss brewer making farmhouse but didn’t know about Sahti.